You may have gathered by now that we are fans of the Pistol Lake Eudae fabric. The two pieces we’ve previously reviewed (the Minimalist Performance Tee and Raglan) are both made with the Lightweight Eudae. 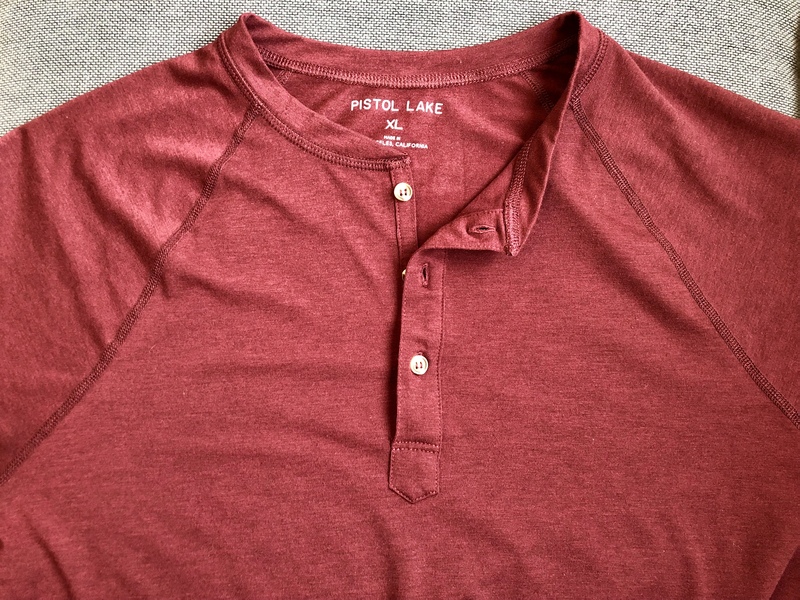 The One-Bag Henley is made with Midweight Eudae (76% polyester, 19% Tencel, and 5% spandex). The Midweight Eudae is about twice as thick as the Lightweight. While not a heavy thermal shirt, this shirt is much more substantial than the Minimalist Performance line of shirts. I wouldn’t want to wear this shirt in the summer, but it would certainly be a top pick for any other season. As someone who gets hot during workouts, I could see this being a good shirt for hiking in the colder seasons, but would not want to wear it to the gym. Just like the other Eudae shirts, I can get quite a few wears before it needs to be washed. If I am getting sweaty, I can get about four wears, if it’s just normal wear, I can get about a week. This is better than I get with standard cotton or polyester, but not as good as merino. As I’ve come to expect from Pistol Lake, this shirt fits me perfectly. It looks tailored with an athletic fit but is not too tight. The shirt length is also perfect, just a little longer than the usual. The raglan sleeves (meaning the sleeve extends in one piece to the collar, leaving just one diagonal seam under the arm) make for an extra comfortable shirt. These sleeves, along with the flatlock seams and odor resistance make this shirt live up to its “one-bag” name. The only finish issue I’ve noticed is the bottom of the button placket was sewn slightly crooked — not something that is easily noticeable, but something I picked up on. I brought this to the attention of Pistol Lake, and as they are currently sewing a new batch, they will make sure to pay attention so no more go out like that. This, of course, is something that would be covered under their return policy. The One-Bag Henley has taken a top spot in my wardrobe as a “nice casual” shirt — a step up from a long sleeve tee. It looks just like a nice cotton henley while performing better. While currently out of stock in almost all colors and sizes, this shirt should be back around the beginning of March.